Here in Hawaii, we live among the largest concentration of United States Military bases and compounds in the country. There are around 50,000 military personnel assigned to Hawaii, and that number has steadily risen every year. The Hawaii military presence has a huge impact on the economy of the state, generating nearly $15 billion for Hawaii’s economy. The military bases in Hawaii impact civilians as well and have created an estimate 100,000 civilian jobs across the many military bases across Hawaii’s islands. Life in Hawaii is like no other. There’s always something fun to do and you can wear shorts and relax on the beach in the middle of winter. It’s an OCONUS (outside continental United States) post, yet it’s still part of the US, so there’s no need to worry about passports or currency conversion rates. Now let’s talk about the pros and cons of being stationed in Hawaii. You’ll surely fall in love with Hawaii’s natural beauty, perfect weather, and Aloha spirit, but you might not love the higher cost of food and goods and how far away it is from family. Every duty station has positives and negatives, for many, living in Hawaii is a once in a lifetime opportunity that they can’t pass up. Where are the military bases in Hawaii? 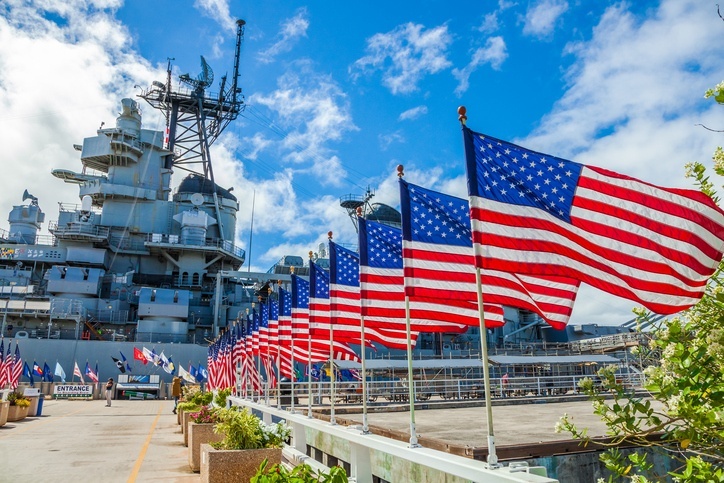 Hawaii is one of the few states that has at least one base from each branch of the military — Army, Navy, Marines, Air Force, and Coast Guard are all represented throughout the state. There are a total of 11 bases all across Oahu, Maui, Kauai, and the Big Island, many of which served a vital role in WWII. No matter where you are in Hawaii, you’re never too far from a military base. Hawaii is a tiny island chain known for its beaches, so when people first learn about the strong military presence here, they wonder how many military bases are in Hawaii. Hawaii is home to 11 military bases, and there is at least one for every branch. The Marine Corps is actually its own branch in the Department of the Navy. The National Guard is a department of the Army, not an actual branch. Marine Corps, Navy, Army and Air Force fall under the jurisdiction of the Department of Defense. Only Officers may fly in the Military. A hat is not a hat…it’s a cover. The Navy and Coast Guard are sea, Army is land, and Air Force is air. Only the Marine Corps are all three. The Navy is actually older than the United States is – by 8 months. When Pearl Harbor was attacked there were no aircraft carriers in port. Not one. Those were one of the primary targets for the Japanese attacking forces. Shipwreck U is the nickname for the US Naval Academy at Annapolis, Maryland. Historically, only the Marine Corps changes the camouflage uniform colors seasonally, woodland (green/black) and deserts (tan/brown). Marine Corps are the only military not allowed to wear their cammies off base, only to and from their place of residence. That’s why you will never see them at the grocery store in cammies where you will see members of other military branches. The term “a cup of Joe” came to be as a result of such heavy coffee consumption by G.I. Joes (Army) in WWII. Most people assume that the Blue Angels aerial demonstration team are part of the Air Force. Not true, they are Navy. The United States Military Academy at West Point has trained more Officers than any other institution. The U.S. Air Force was part of the Army until 1946. It was called the Army Air Corp. The Navy Band was playing the Star Spangled Banner at the time of the attack on Pearl Harbor. Army Captain Ronald Reagan signed Army Major Clark Gable’s discharge papers in 1944. People always have a lot of factors to consider when they get their PCS orders to Hawaii. You will have to decide whether you want to live on or off base, find a home if you choose to live off base and learn how to move your family’s belongings and cars. Where is the Naval Base located in Hawaii? The US Naval base in Hawaii, Naval Station Pearl Harbor, is located near Honolulu, Oahu. This important Honolulu Naval base was the site of an attack that triggered the US entry into World War II. What is the name of the Air Force Base in Hawaii? The Air Force base in Hawaii is called Hickam Air Force base. It is located just west of Pearl Harbor on the south coast of Oahu. This base is joined with the Naval base in Hawaii and is now part of Joint Base Pearl Harbor—Hickam. The Hawaii AFB also shares a runway with Honolulu International Airport. Looking for more information about Military Life in Hawaii? Find a Hawaii Life agent or give us a call today at 1-800-370-3848. Pssst…USMC Gunnery Sargeant Quiroz, Staff Sargeant Anderson and Army (soon to be) Sergeant First Class Kelly, this one’s for you! The attack at Pearl Harbor left us ironic lesson that could be remembered from generation to generation, a war always begets misery and collateral damage on mankind..
Pearl Harbor is a Military Base that is located on the Island of Oahu, Hawaii. There is a US Navy base at Pearl Harbor that has Naval ships (Navy ships) that are capable of supporting military fire-support missions. The US Navy base is called ‘Naval Station Pearl Harbor’. On Sunday December 7th, 1941 Japanese military airplanes launched an air assault on the US Naval base at Pearl Harbor, the air assault was a surprise military attack on Pearl Harbor. After December 7th, 1941 Pearl Harbor was rebuilt and it still remains as an active military base until today. Hickam Air Force Base is a Military Base that is located near Pearl Harbor on the Island of Oahu, Hawaii. Hickam Air Force Base is a Military Airport where military airplanes, fighter planes, military helicopters, attack gunship helicopters and other military aircraft are parked, refueled and reloaded. Joint Base Pearl Harbor–Hickam is a United States military base adjacent to Honolulu, Hawaii. It is an amalgamation of the United States Air Force Hickam Air Force Base and the United States Navy Naval Station Pearl Harbor, which were merged in 2010. Joint Base Pearl Harbor–Hickam is one of 12 Joint Bases the 2005 Base Realignment and Closure Commission created. It is part of Navy Region Hawaii and provides Navy and joint operations Base Operating Support that is capabilities-based and integrated. Pearl Harbor is 8 miles from Honolulu. The Naval Computer and Telecommunications Area Master Station, Pacific (NCTAMS PAC), Wahiawa, Hawaii is the world’s largest communication station. The headquarters site of this shore command is located in the central section of the island of Oahu, approximately three miles north of Wahiawa. Hickam Air Force Base was named in honor of aviation pioneer Lt. Col. Horace Meek Hickam. It is under the jurisdiction of Pacific Air Forces (PACAF), which is headquartered on the base. Hickam Air Force Base remains the launch point of strategic air mobility and operational missions in support of the Global War on Terrorism as well as special air missions in support of the Commander, U.S. Pacific Command (USPACOM) and Commander, Pacific Air Forces (PACAF). In 2009 the base was used as the temporary operating location for Air Force One during Barack Obama’s Christmas vacation at Kailua, Hawaii. Joint Base Pearl Harbor–Hickam is a United States Navy and United States Air Force base in the U.S. state of Hawaii, on the south shore of Oahu. The navy base was started in 1899 and merged with the air force base in 2010. It is 8 miles (15 km) west of downtown Honolulu. The Japanese bombed Pearl Harbor, on December 7, 1941, which was a surprise. The attack led to America’s fighting in World War II. The reason the Japanese attacked Pearl Harbor was to destroy the U.S. Navy (Seventh Fleet), and prevent the U.S from stopping the Japanese expansion in Asia. Coast Guard Station Honolulu is a United States Military Base that is located In Honolulu, Oahu, Hawaii. This highly classified military base is owned and operated by the United States Coast Guard to help protect Hawaiian coastlines from attackers, terrorists, hijackers, pirates and other security threats. Coast Guard Station Honolulu also houses Coast Guard ships, Coast Guard patrol boats (Armed with machine-guns), Coast Guard helicopters, military patrol boats (Armed with machine-guns, Coast Guard anti-piracy ships (Armed with weapons such as missile launchers, artillery cannons, machine-guns and including anti-aircraft close-in-weapon systems) and including other Coast Guard ships. Sorry Ken Wyant. Saluting Enlisted personal wearing the MOH is not required by any regulation. Would I, absolutely and have done so a few time. Having recently retired from the Americas Navy i find myself having more time to read and post on awesome articles like yours!! Thank you!! You really made todays hunt worth braving the internet seas!! They say a Smooth sea Never made a Skilled Sailor and im learning quickly that those same skills can be applied to the hunt for solid reading material!